If you happen to be in the vicinity of Hemet, CA tomorrow, you might consider stopping by the Hemet Library at about 2:00 PM. 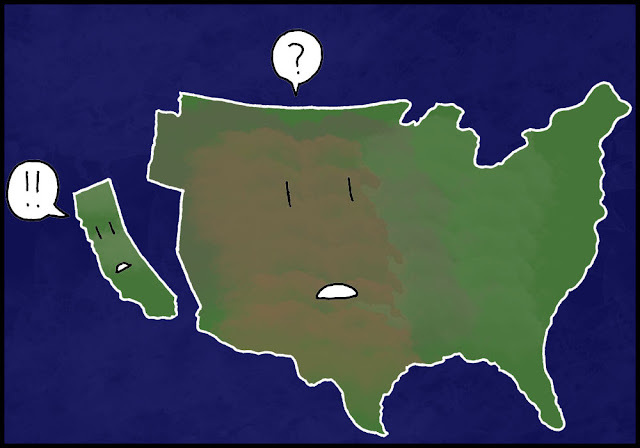 I'll be giving a presentation on "What you already know about earthquakes...are you right??". We'll be talking about some of the myths and misunderstandings about earthquakes, and maybe shed a bit of light on the earthquake hazards of Southern California. We got back from a long journey across the harsh and beautiful lands across the American Southwest, but we had an out-of-state visitor, so with a whole day's rest, we felt compelled to go and see the incredible valley that lies just 90 miles uphill from my home. It's Yosemite Valley, one of the most unique valleys in the world. It's simply stunning, and despite the drought conditions that prevailed during much of the (un)rainy season this year, it was surprisingly green (the late season rains kind of saved the water-year). I am truly horrified by the developments of today and of the last few weeks. My entire identity as an American has come into question because of things done in our name as citizens of this country. I'll save the politics for another forum, but as I thumbed through my images of the trip from last week, I was reminded of at least one aspect of what being an American is: a preserver of the wild places. The National Park system has been described as America's best idea, the idea that some places, some landscapes are so unique, so sacred, that we proposed to preserve them for all time. Yosemite Valley was set aside in 1864, more than a decade before the first national park was established at Yellowstone in 1876. It became an official national park in 1890. Visiting on a weekday, and seeking out some of the quieter corners of the valley floor, one can still get a sense of the majesty of Yosemite Valley without feeling like one is waiting in line at Disneyland. Get out and walk the trail that winds around the edge of the valley. Bring or rent a bicycle. Get away from the stores, the visitor centers, the standard viewpoints, and experience the valley, if you can. If you can't get to Yosemite, check out these pictures and realize that this is your land, your valley, a place that no one can be allowed to take from you. But also realize that there are hundreds of units in the national park system, many of which may be near you. Visit them, learn about them, and be ready to protect them from those who would use bad laws and corrupt courtrooms to develop strip mines, drill oil wells, or cut down forests. These are your lands. Fight for them. They are precious. To be sure, I enjoyed myself. It was about 5:45 in the afternoon and we were out and about doing errands. I had been called into an emergency meeting about the soon to be constructed outdoor education lab at my campus. It turns out that bids came in way too high so we had to start making a list of things that we were going to have to give up in order to get the project built. It was a series of difficult choices. To blow off steam, we decided to see what was being shown at the local cinema. 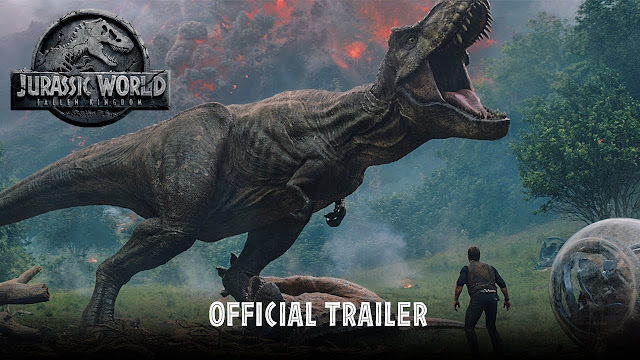 The next movie, at 6:35, was Jurassic World: Fallen Kingdom. We got our popcorn and soda and headed in. After 30 minutes of trailers, the lights dimmed and the movie began. As scenes unfolded, I imagined the meeting that went on before this movie was greenlighted: "we have millions and millions of dollars, how many things can we throw up on the screen?" In other words, the direct opposite of my meeting. It's almost as if we've lost our fascination with dinosaurs, so we needed our film to be spiced up with all kinds of movie tropes: volcanoes, lava flows, pyroclastic surges, gothic mansions, secret underground laboratories, not one, but three or four dastardly villains, and deeply hidden family secrets. There was the obligatory child in distress. And (spoilers ahead!) some people get eaten, others almost get eaten, lava almost eats somebody, and there was an unusually moral component in the character of those who ended up as part of the dinosaur buffet. And the poor Brachiosaurus brought a tear to my eye. But I am a geologist, so let's get to the important part of the review: did they get the geology right? But taken as individual scenes, some of the geology was okay. As in practically all Hollywood movies, the director mixes up his volcano genres. Isla Sorna, 120 miles off the coast of Costa Rica, is a volcano without an origin (the island doesn't exist of course, but the location doesn't make much geologic sense unless it resulted from a hot spot). When deciding the mayhem to be produced by a volcano, one must choose: is it an oceanic hot spot that produces shield volcanoes and basaltic lava flows and, as Kilauea has shown us these last few months, the occasional phreatic (groundwater) explosion? Or is it an island arc stratovolcano, whose andesitic or rhyolitic magmas produce violent caldera eruptions? The movie cannot make up its mind: there are scenes of basalt flows and Hawaii-like scenery, but on the other hand, the climactic eruption is composed of explosive ash columns and pyroclastic surges. The climactic volcano scenes have the heroes outrunning (or out-rolling) the pyroclastic surge which would seem highly unlikely in real life. 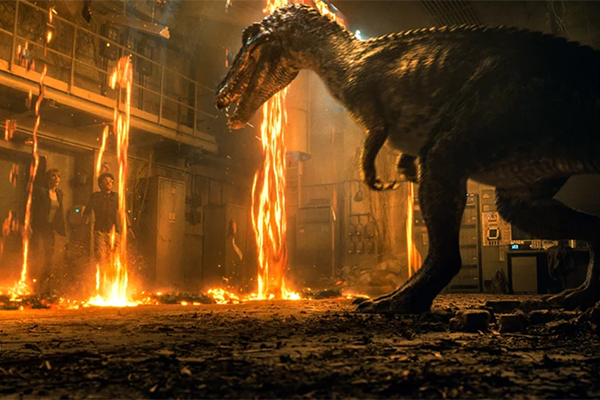 The Chris Pratt character looks to have inhaled some of the ash which should have caused him some severe respiratory problems later on in the movie. He also should have experienced some severe burns from his close encounter with flowing radiant lava. I was actually bothered a bit about how the ferry was able to get underway without damage from the incandescent pyroclastic flow on the dock. It was necessary I guess to get the emotional impact over the demise of the aforementioned Brachiosaurus. But my biggest beef is the failure in imagination concerning the "extinction-level" volcanic event. The eruption that is supposed to have destroyed all living things on the island was kind of underwhelming. A ferry boat was able to outrun it. There was (to my memory anyway) the barest of an eruption column. If this was really the kind of volcanic event that would erase all life from the island, there should have been a caldera-forming eruption like that of Krakatoa (1883) or Tambora (1815). The sky should have been blotted out and the ship should have been enveloped in darkness. Maybe next time they should consult with me, because I have a great idea about how the island could have been destroyed, and it would have had some great visuals. Some irresponsible websites have been criticized for suggesting that the Big Island of Hawaii could suffer unprecedented catastrophic damage caused by the collapse of a flank of the island into the ocean. Such an event is simply not in the cards for Hawaii right now, but some memorable slides have happened in prehistoric times. The long runout debris avalanches caused thousand foot high tsunamis that would have ravaged many coastlines around the Pacific Ocean rim (not to mention in the Hawaiian islands themselves). Imagine a gigantic eruption column with ash flows spreading over the entire island and then an entire flank sinking into the ocean producing a gigantic tsunami that nearly destroys the escaping ship. But almost no one ever thinks to ask me (believe it or not I did scout out shooting localities for a proposed Hollywood movie once). The dinosaurs in the movie are fine, although there were exaggerations of scale, especially with the Mosasaur (oh, and the Mosasaurs and Pteranodons in the movie aren't dinosaurs; they occupy separate lineages within the reptile clan). The one in the movie was WAY too big. 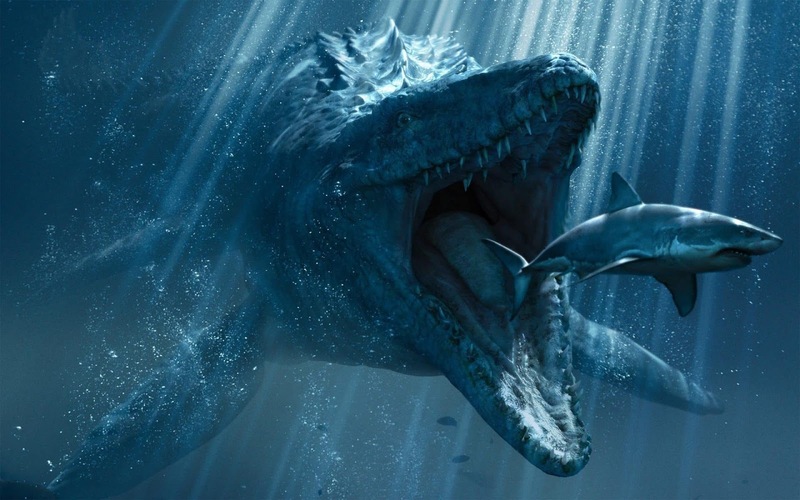 Mosasaurs have been found as fossils in our region and many others, and they're no larger than 35 feet or so. Terrifying, yes, but not the behemoth that existed in the movie's universe. And where did they get Mosasaur DNA? I don't think mosquitos had much of the chance to bite these deep-diving marine creatures. There's a larger issue though. 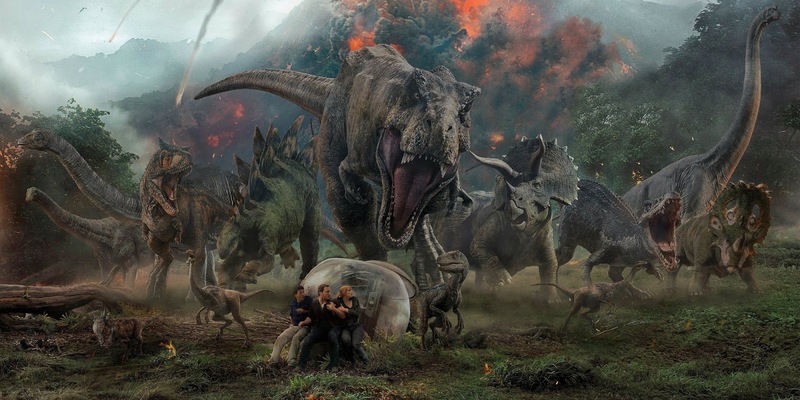 A central tenet of the movie was the desire of the movie's protagonists to let the dinosaurs live together in a big happy stable ecosystem. The problem is that the dinosaurs they resurrected never lived together in an ecosystem. They would have all technically have been invasive species. Many or most of the interactions between these species and their environment would have been problematic, including food sources for the herbivores (no grass or flowers during the Jurassic, for instance), and no evolved defenses against viruses and other disease-causing organisms. Our present-day efforts to bring back mammoths make a bit more sense since they've been extinct for only a few thousand years, and they lived in ecosystems much like those that exist today. But still, all in all I enjoyed the movie. Geology criticisms aside, I'd give it a B+. If you are familiar with the Chronicles of Narnia, you will remember the novel where the children go through the wardrobe into a magical world and live out their lives to adulthood. At the end of the story they step through the wardrobe back into our world where they are once again children. Little actual time had passed. A journey through alien lands like those of the Colorado Plateau is much the same. One can work and sleep and study and weeks will pass and little will change in one's life. Then, you are ripped away from everyday life and spend two weeks exploring corners of the world that you barely believed existed and each day, each hour is a life-changing experience. More happens in just two weeks than will happen in months or years of an everyday life. I've been doing trips like this across the Colorado Plateau for 34 years now, and each one has been unique. There have been new insights and new discoveries every time. Sometimes there have been scary moments, and there have been moments of inspiration and beauty that border on the sacred. Our journey this year was no exception. I got to know twenty unique people, and we shared some interesting times together. I will no doubt have much to say about the geology and natural history of the places we visited in future blogs, but for the moment, I've gone through my 2,300 pictures and selected some of my favorites. It will take several posts! The Mojave National Preserve is not actually part of the Colorado Plateau, but we needed a place to stay on the way there, and I can't think of a more interesting spot than Hole-in-the-Wall and Banshee Canyon (above). There's a trail that winds through the bizarre canyon with rings placed in strategic spots to allow access. It's not the plateau, but there is a connection: 18.5 million years ago a colossal rhyolite caldera eruption sent ash drifting across a vast region. The same ash exposed on the Rings Trail is also found on parts of the rim of the Grand Canyon near Peach Springs, Arizona. We spent a night at Zion National Park which is crowded beyond all reason these days. Too many people want to share a very small space, and the experience of seeing the park is diminished by the crowds. The obvious answer is to make more parklands available, but our government is going the opposite direction, unfortunately. Still there are moments of peace and beauty. The red rock country is always more astounding at the beginning and the ending of each day when the canyon walls are lit by the horizon-level sun. I woke up at 5:45AM to see the sunlight on the canyon wall opposite our camp, and all was quiet. I could have been the only person there at that moment for all I could hear. 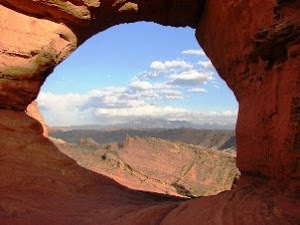 The Transcept Trail follows the rim over the Transcept, a deep tributary to Bright Angel Creek which is itself a tributary tot he Colorado River. In any other place a canyon like this would be its own national park. Grand Canyon National Park is another place where crowding is rampant and the atmosphere is much like Disneyland. But Grand Canyon is a much larger park, and there are many places where one can find peace. For one thing, a person can visit the North Rim, which gets a mere 10% of park visitation. And once there, walk a little bit. I spent an hour one afternoon walking the Transcept Trail, and saw only three or four people. I snapped the shot above from one of the many overlooks along the way. The canyons of the Colorado River are rugged, to say the least (the Grand is just one of them). For decades Lee's Ferry was the only crossing for more than two hundred and fifty miles downstream (and almost as much upstream). In 1928 the Navajo Bridge was completed, allowing auto traffic to make the crossing unimpeded. The bridge was not designed for modern trucks and was augmented in the 1990s with a twin bridge of greater strength. The old bridge is now a walkway, and one can stand 700 feet above the Colorado River just a few miles downstream of the old ferry. California Condors soared overhead while we were there. I chose this picture because of the memories it stirred of my incredible journey down the Colorado in 2013 with my brother's family. The bridge was the last recent piece of human architecture we would see for nine or ten days. I was a tiny bit jealous of the rafters passing below, but I was on an epic journey of my own with a bunch of special people. A short distance up the road was another imposing sight, the Horseshoe Bend on the Colorado River. It's just a few miles downstream of Glen Canyon Dam, and was a local secret for a long time. Word is out now and the small dirt parking lot is often overrun with buses and tourists hiking in inappropriate shoes and without hats in the stifling (and dehydration-producing) heat. It is in the process of falling victim to "industrial tourism" as authorities are constructing a parking lot, a concrete pathway, and some fencing at the cliff edge. I guess the "improvements" are necessary, given the stupid chances I saw people taking to get their selfies on the cliff edge. House on Fire Ruin in Mule Canyon. I photographed the ruin years ago without realizing the presence of the "flames" formed from differential weathering of crossbeds in the sandstone. My most treasured moment came the next day. We were headed to one of the important cultural sites on the entire Colorado Plateau. A thousand years ago, Cedar Mesa was one of the most critical agricultural landscapes in the entire region, being a thousand feet above the barren deserts of Monument Valley and Mexican Hat, and thousands of feet below the mountains that were coated in snow for much of the winter. It was the sweet spot for growing large yields of beans, squash and maize. For centuries thousands of the Ancestral Pueblo people made the mesa their home, building villages on the mesa top, and cliff dwellings and pithouses in the alcoves just below the rim. They left the region totally in the late 1200s leaving behind thousands of cultural sites that are still only beginning to be assessed and excavated. Five regional tribes consider the lands to be sacred. The region is public land, managed by the Bureau of Land Management, a chronically underfunded part of the federal government. The archaeological sites have been ravaged by the resident pothunters and grave robbers who live in the region and think that these resources are their own personal cash cow. I read somewhere that around 90% of the known sites have been attacked by pothunters, sometimes using picks and shovels, sometimes with bulldozers. They'll even charter helicopters to fly them into remote sites. With this vandalism in mind, politicians and stakeholders worked for years to propose a national monument, and when Congress failed to act, President Obama made the monument a reality. Bear's Ears National Monument was established in 2016. In an egregious betrayal of the law, the present administration shrunk the monument by 90%. The act is being challenged in court, but mining companies are already staking claims. It's a hideous shame. We walked up Mule Canyon listening for the ghosts of those who came before. We found House on Fire ruin, some eerie hand prints on an overhanging rock, and several other incredible ruins (a long way) up the canyon. I walked six miles in the hot sun with not enough water (I don't recommend walking with insufficient amounts of water). It had been around fifteen years since I last traveled up the canyon. One of my special moments happened as I was waiting for two new tires to be installed after we got a series of flats. Right there in the city limits of Cortez, Colorado there was a little prairie dog town. They ducked every time a car went by. The picture above needs explanation. That's a cloud, yes, but an unusual one. It's a pyrocumulus cloud, generated by the disastrous La Plata (416) Fire that was burning north of Durango, Colorado. Huge plumes of superheated air rise and cool in the upper atmosphere, condensing to form the gigantic clouds. Unfortunately they don't produce any significant precipitation (wouldn't it be nice if wildfires came with their own extinguishers?). But looking at the drought-induced fire burning beyond the ruins of Mesa Verde caused me to consider the "cycle of life", or more correctly the cycle of human habitation. Many hypotheses concerning the abandonment of the region by the Ancestral Puebloans involve extended droughts and overuse of the available resources. The drought in 1285 AD had lasted around 25 years. We are currently in another drought that has now lingered for two decades. The Colorado River supplies water for cities and farms across the entire southwest, but the two giant reservoirs that store most of the water are barely half full, and if the drought continues (as predicted by some global warming scenarios), the lakes will become useless pools and cities throughout the region will be in serious trouble as a result. The Ancestral Pueblo people left for wetter climates 700 years ago. What alternatives will the current residents have? These are my favorite pictures from the first six days of our journey. More will be coming! 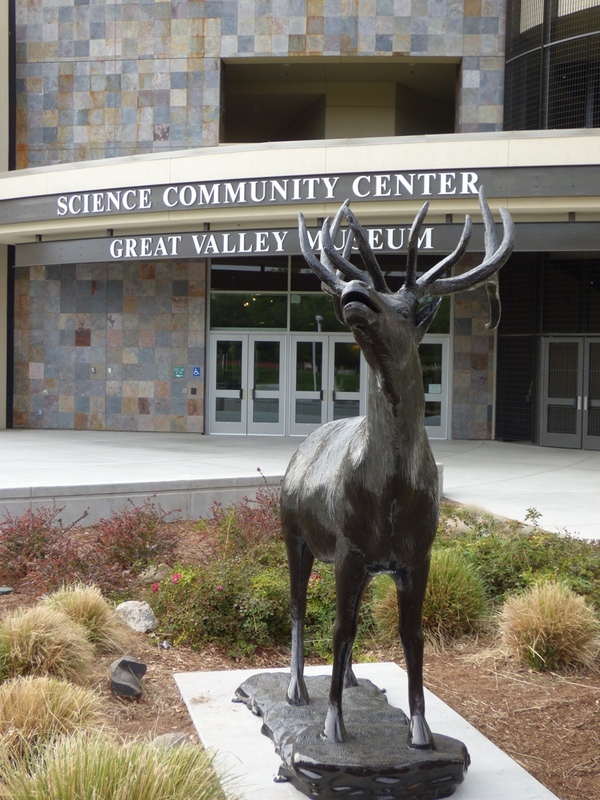 The Great Valley Museum at Modesto Junior College has existed for more than thirty years. The first three decades it occupied a 1940s-vintage building on our east campus that had just three display rooms. A decade ago our county voted for a bond issue that included the construction of a new Science Community Center that housed the science programs, but which also included a new museum space that was some five times larger than the old facility as well as a separate curation and storage building. It will also soon have an Outdoor Education Lab as well. The museum includes a world-class planetarium, a Foucault Pendulum, and a Science on a Sphere projection system. 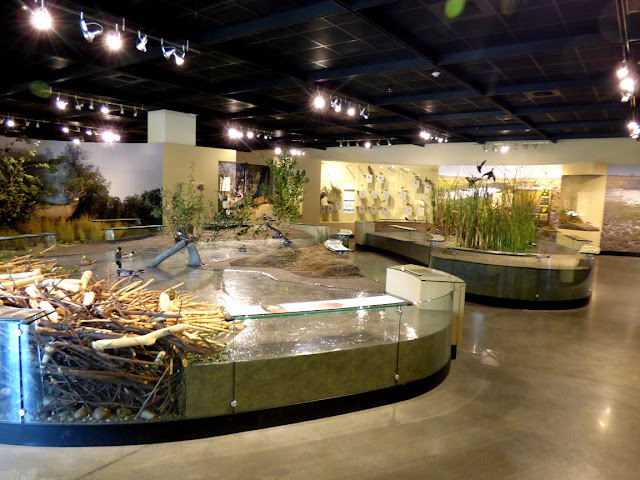 Our museum serves thousands of students every year who are exposed to the natural history of the Great Valley, a virtually unknown concept to many of the kids who are not able to travel out of our region into the wildlife refuges and river parks that exist outside our city limits. Does this sound like the kind of place you might like to work? The museum has two full-time positions available, a museum office technician, and a museum specialist. The closing date for applications for both positions ends on Thursday, June 28. Information and job descriptions for both positions can be found at https://yosemite.peopleadmin.com/postings/3427?blm_aid=25226 and https://yosemite.peopleadmin.com/postings/3428?blm_aid=25226. I should be getting some sleep right now, as we are leaving early on our journey to the Colorado Plateau, but I received sad news today, and couldn't let the moment pass to mention the life of Ron Schott. He passed away unexpectedly, and long before his time. 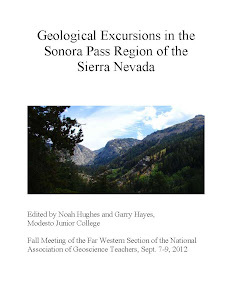 Ron was a modern geological pioneer, writing one the earliest geology blogs (The Geology Home Companion) which was a factor in my decision to begin blogging a decade ago. 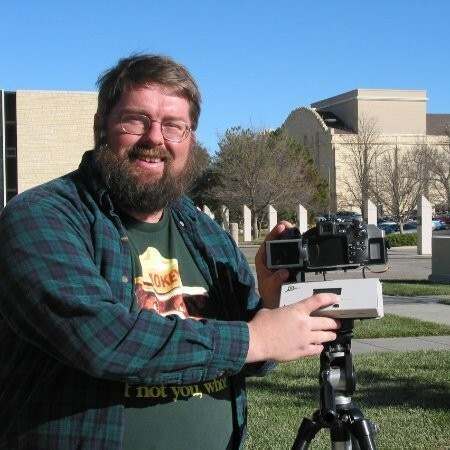 He was a leader in utilizing all forms of social media to promote geological knowledge, and was especially well known for his production of Gigapan images. Early on, I learned of Ron because of the "Schott Rule" in the "Where on (Google) Earth?" web contest. He was so good at tracking down the location of the most obscure Google image that as I recall, he had to wait to give others a chance to find the location. I was privileged to meet him several times when our paths crossed in the field. Most memorably, he met us outside Bakersfield late one rainy night when we were expected to arrive for camping on the first night of our yearly Death Valley trip. He actually made chocolate chip cookies for the entire crew. Ron will certainly be missed. My condolences to his family and friends.